To the vegetable skeptics who doubt that eating your daily greens can be not just reasonably tolerable but downright delicious, I present Zucchini Cookies with Chocolate Chips. Stay where you are. To the dessert skeptics who saw the words “zucchini” and “cookies” next to each other in the recipe title and thought, “Keep your veg away from my dessert,” you stay put too. And to my fellow fans of sneaking in a bit of extra veg, both when it doesn’t hurt a recipe and when, as in the case of today’s Zucchini Cookies, it makes the recipe even better…wait, why are you still reading this? Get into your kitchen and start baking already! 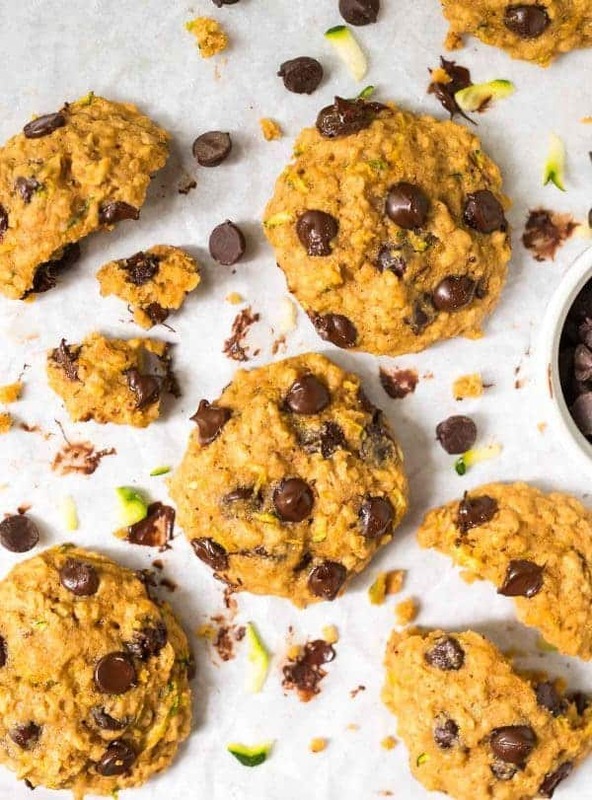 No matter how you feel about vegetables, cookies, or the separation thereof, after one tender bite of these lightly buttery, soft, chocolate-chip-stuffed healthy zucchini cookies, I promise you won’t be worried about anything other than reaching for a second (and third). ONE: 100% whole grain. Along with white whole wheat flour, which tastes just like regular all-purpose flour in the recipe but offers more protein and fiber, the cookies call for oatmeal. The oats gives the zucchini cookies a delightful texture, as well as a homey, comforting vibe that I adore. 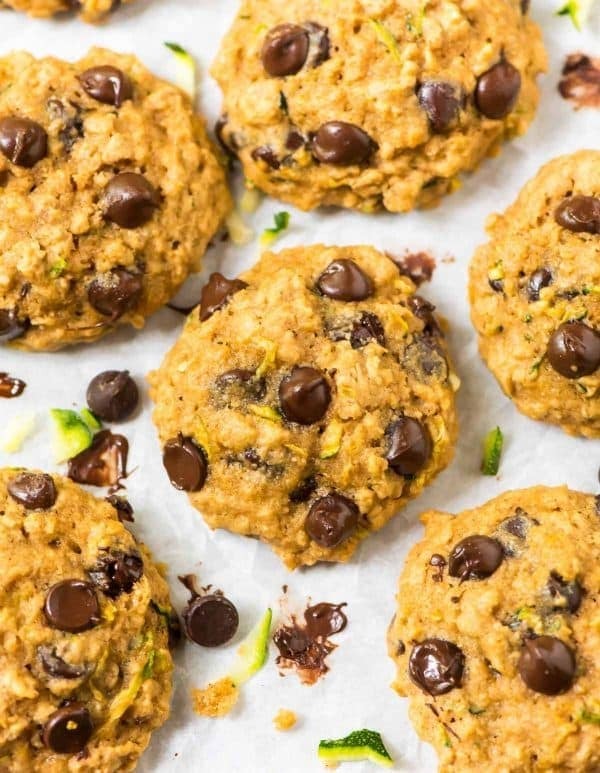 Plus, the transformation of the recipe from zucchini chocolate chip cookies to into zucchini oatmeal chocolate chip cookies, means we can absolutely eat them for breakfast, yes? ^^If you are still looking for an answer, it’s YES. TWO: Naturally sweet. In place of regular sugar, I used a mix of honey and coconut sugar, which is less processed than white or brown sugar and gives the Zucchini Cookies a delightful, almost caramel-y backnote. FOUR: CHOCOLATE! I used a heaping helping of smooth dark chocolate chips, and next time I plan to toss in a few walnuts too. 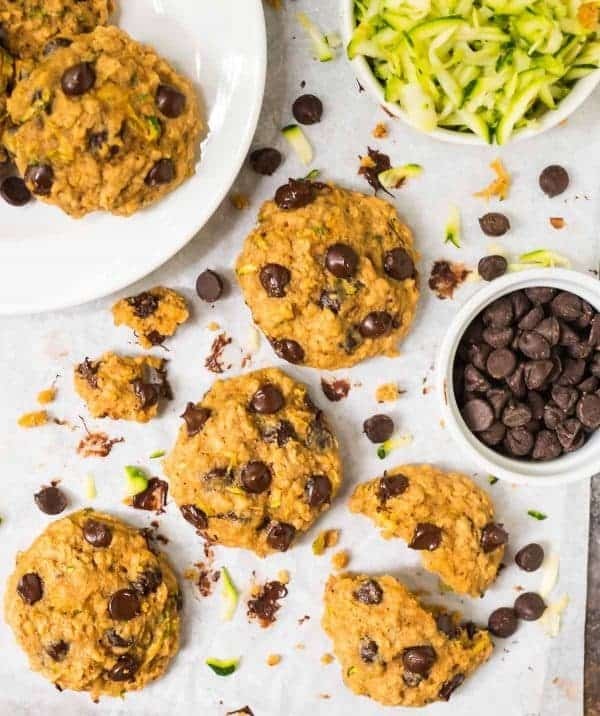 If you prefer to make extra super-duper healthy zucchini cookies, you can omit the chocolate chips or replace them with a different mix-in (zucchini raisin cookies sound tasty too). FIVE: It’s summer, and zucchini is all-the-time everywhere. Take advantage of summer’s bounty. Bake yourself, your friends, and your coworkers a batch of Zucchini Cookies with Chocolate Chips. It’s the right thing to do! If you like these Zucchini Chocolate Chip Cookies, don’t miss this recipe for Zucchini Brownies! 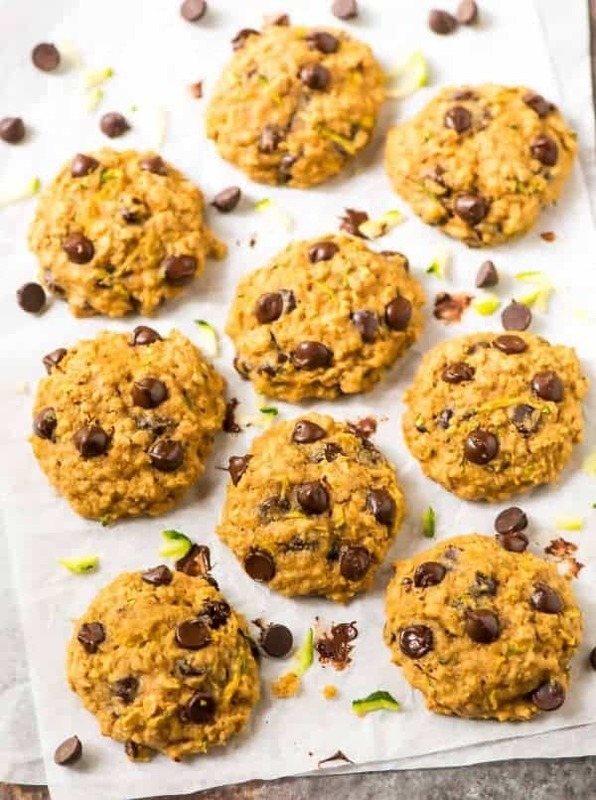 Healthy Zucchini Cookies with Chocolate Chips and Oatmeal. Soft, buttery, and naturally sweetened with honey. A delicious way to use up summer zucchini! Preheat the oven to 350 degrees F. Lightly coat a baking sheet with nonstick spray or line with parchment paper or silpat mats. Place the shredded zucchini between layers of paper towel, then thoroughly squeeze out as much excess water as possible. Set aside. In the bowl of a stand mixer fitted with the paddle attachment or a large mixing bowl, beat the butter on high until completely smooth and creamy, about 2 minutes. Add the coconut sugar and beat on medium high for 3 full additional minutes, stopping to scrape down the bowl as needed. On high speed, beat in the honey and Greek yogurt, then the egg and vanilla until completely combined. The mixture may look curdled, but it will be fine. Scrape down the mixer as needed and blend the batter as well as you can. In a separate bowl, whisk together the whole wheat flour, oats, baking powder, salt, baking soda, cinnamon, and cloves. On low speed, slowly add one-third of the dry ingredients to the wet. By hand, fold in half of the shredded zucchini. Mix in the next third of the dry ingredients (again on low speed), fold in the remaining zucchini, and finally mix in the last third of the dry ingredients. By hand, stir in the chocolate chips. With a cookie scoop, portion the cookies onto the prepared baking sheets. Bake for 11 to 13 minutes, until the tops are barely set and the edges are dry to the touch. They may seem underdone, but do not overbake or the cookies will be dry. Let rest on the pan for 5 minutes, then transfer to a wire rack to cool completely. Batter can be prepared and stored tightly covered in the refrigerator up to 1 day in advance. Store leftovers at room temperature in a paper-towel-lined airtight container for up to 1 week or freeze, tightly wrapped, for up to 3 months. Let thaw overnight in the refrigerator or at room temperature. To make the cookies gluten free: I have not yet experimented, but I think you could successfully replace the white whole wheat flour with gluten-free oat flour, adding an additional 2 to 3 tablespoons if the cookie batter seems too wet. An all-purpose gluten-free flour blend like this one would also work well. Ensure your quick oats are certified gluten free, like these are. To make vegan: I have not yet tried the recipe this way, but I think you could use a vegan buttery spread in place of the unsalted butter, replace the honey with maple syrup, the egg with a flax egg, and the Greek yogurt with a nondairy yogurt. i make muffins with chocolate chip and zucchini, so good. i cant wait to give this a try. These look so delicious! Such a perfect Summer cookie!! I have so much zucchini from my CSA and can’t wait to give these a try! These are excellent for those overflowing CSAs, Lexi! I love that you made these GF for me! right? Gah, all the zucchini and chocolate. I”m in heaven with your recipes ! 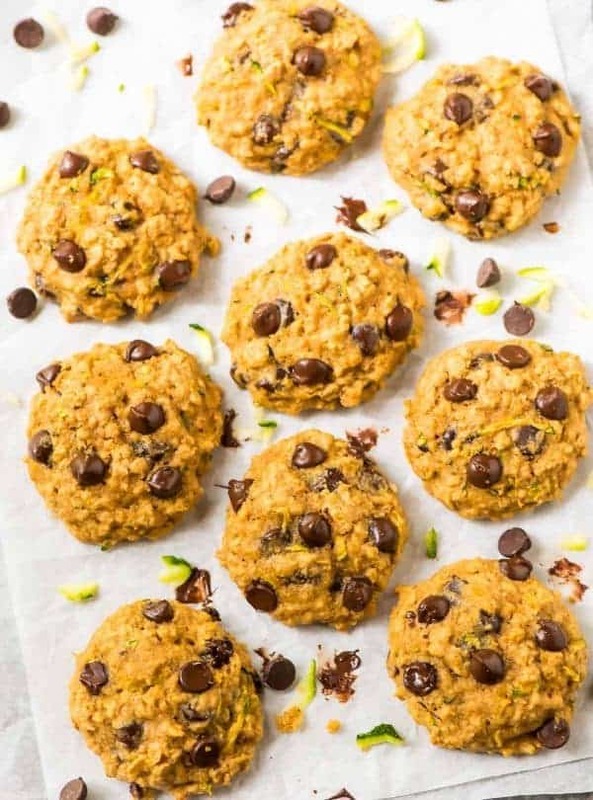 LOVE that these cookies are made with zucchini–that gives us an excuse to have a second one, right?! Wow, these sound so tasty!! I never thought you can actually use zucchini for a cookie. My curiosity, and their delicious look of course, will make me try them out over the weekend. I’d love to know what you think, Kristen! These are fabulous! I substituted the chocolate with raisins, and used light brown sugar. I love a hearty, not-too-sweet cookie these fit the bill perfectly! Anne, I’m so glad to hear you enjoy the recipe! Thanks so much for giving it a try and reporting back. Hello again from Germany! I am slowly cooking and baking my way through your recipes :-) Made these yesterday after a very long and hectic all computer and telephone day to unwind. I have mixed feelings about the result: Taste-wise, I think the cookies are excellent. The texture, however, is not really my cup of tea, too soft. I forgot my second batch in the oven and took them out after approx. 20 – 25 minutes – they were much darker (who would have thought) but not even those were the tiniest bit crunchy. I am making a zuchhini cake from time to time, I think I prefer that over these cookies. Still, they are a nice treat and I love that they are not too sweet and very low in fat! Thank you for the wonderful way of presenting interesting recipes, I feel very inspired by your blog. Sophie, thanks so much for taking the time to leave your feedback! I’m glad you enjoyed the taste of the cookies, even if you prefer a more firm cookie. These are definitely on the soft side. Thank you so much for the kind words about my blog! Hello Erin. I made these cookies today. The taste is delicious. However, after they cooled off on the rack, they fell apart when I picked them up. They didn’t hold its cookie form. Any idea what could’ve caused this? I would like to try to make these cookies again. By the way, I really enjoy your recipes and your website is one of the main ones I use. Doll, I am honestly not sure! Did you measure and really press the water out of your zucchini? They also could have been a bit overbaked. It’s hard to say without being there with you, but (outside of a mismeasurement or missed ingredient, which happens to us all) that is my guess as to what happened.